The four-year drought in California, which is causing severe water shortages and related problems, is receiving increasingly more attention. It is affecting everyone, causing people to adjust their lifestyles and causing small business owners and entire industries to rethink their use–and misuse–of water. Meanwhile, the longstanding water shortages that are threatening the survival of people in several Middle Eastern and North African countries–and may ultimately threaten the survival of these countries–is receiving scant attention in the news media here in the United States. There is much less freshwater in the world than one might think. Almost 98 percent of water is either salt water or polluted water. Almost two-thirds of the rest is frozen in glaciers and polar ice. Of all water throughout the world, less than 0.01 percent is available for human use. Freshwater is increasingly more scarce in many regions of the world–about one billion people do not have access to safe freshwater. Water shortages in the Middle East, North Africa, and elsewhere are often compounded by climate change, with increasing temperatures and more frequent and more severe droughts, continued rapid population growth, and inadequate political and technical capabilities to address the problem. In addition, much of the available freshwater in the water-stressed Middle East and North Africa region comes from river systems that are shared by two or more countries, such as the Nile, on which Egypt and ten other countries heavily rely. In that region, which is already plagued by widespread armed conflict, water shortages could lead to more frequent and more intractable armed conflict, as a review of data from the past half-century suggests. The number of conflicts over water, between countries and within countries, has increased during this period from 0.37 to 4.61 annually– with about three-fourths of these conflicts being violent or in the context of violence. Water shortages have also contributed to armed conflict within countries. For example, the roots of the civil war in Syria can be traced to drought conditions, which forced many farmers to abandon their farms and migrate to cities, where their opposition to the Assad government was met with violence. Availability of water and efficiency of water use can be increased by reducing unnecessary uses of water, leaks in water distribution systems, and industrial and sewage contamination of water. It can also be increased by improving methods of desalinization and expanding usage of “greywater”–wastewater from sinks, showers, and bathtubs, which can be recycled for irrigation, flushing of toilets, and other uses. Conflicts over water can be resolved by national and local laws and regulations, as well as international treaties; by mediation and arbitration; and by proactive cooperation among countries or among states (or groups) within countries. Such cooperation can not only address water shortages, but also improve food security and increase economic, social, and environmental stability. Public health is what we, as a society, do collectively to assure the conditions in which people can be healthy. Access to safe freshwater is essential for public health–and for sustainable peace between and within countries. Image Credit: “Drought in Cordoba” by Tuomas Puukko. CC BY NC-SA 2.0 via Flickr. Barry S. Levy, M.D., M.P.H., is an Adjunct Professor of Public Health at Tufts University School of Medicine. Victor W. Sidel, M.D., is Distinguished University Professor of Social Medicine Emeritus at Montefiore Medical Center and Albert Einstein Medical College and an Adjunct Professor of Medical Ethics in Medicine and Adjunct Professor of Healthcare Policy and Research at Weill Cornell Medical College. 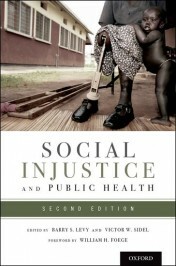 They are co-editors of two editions each of the books Social Injustice and Public Health, Terrorism and Public Health, and War and Public Health. They are also both past presidents of the American Public Health Association. I hope California can update its plumbing codes to make it easier to install a grey water recycling system. I’m definitely jumping on this grey water craze, I mean who wouldn’t? You save water, you save the environment and (best of all) you save money.